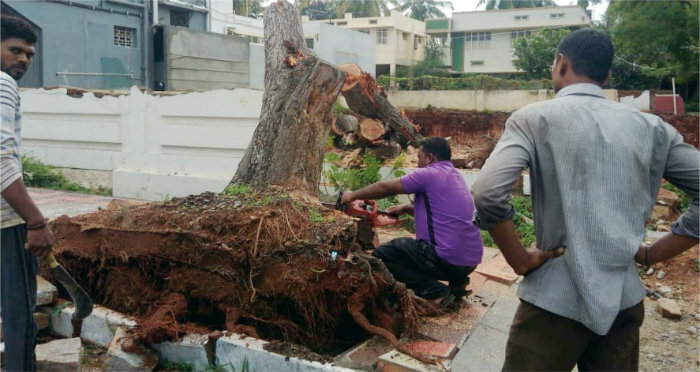 Mysuru: The rain and gusty winds that created havoc in city since the past three days by uprooting many trees apart from causing damage to properties has claimed a life yesterday. The unfortunate victim has been identified as Solarai Revathi (25), a native of Tamil Nadu and an employee of Infosys in Chennai. Revathi had come to Mysuru to visit her friend Vasavi Gupta during the weekend and after visiting her, the friends left in an autorickshaw from Sankranti Circle in Hebbal to the City Railway Station last evening to catch Cauvery Express which departs at 8.30 pm. 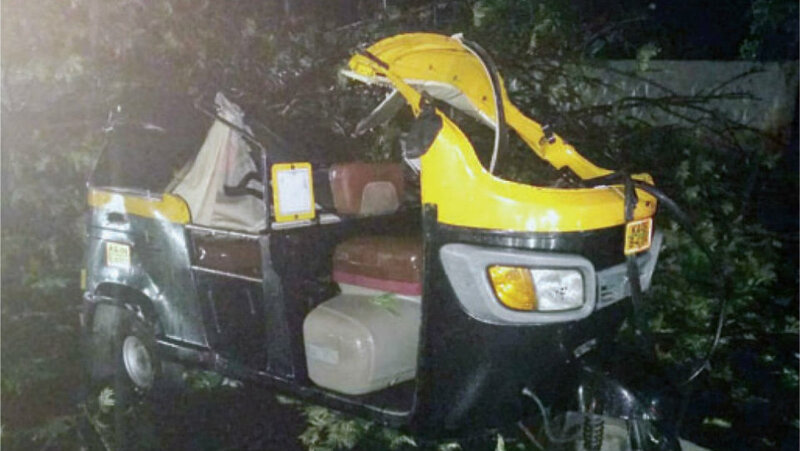 When the auto neared ESI Hospital, a tree got uprooted due to strong wind and fell on the auto resulting in Revathi suffering severe injuries on the right side of her head while the auto driver and her friend Vasavi suffered minor injuries. The public, who saw the auto driver and the girls trapped inside the vehicle, pulled them out and rushed the unconscious Revathi to the nearby Aditya Hospital in Gokulam. The doctors, however, informed that the girl had died midway. It is learnt that a City Bus was following the ill-fated auto and the alert bus driver, who saw the tree falling, applied brakes thus averting a major mishap. Following the tree fall, traffic was disrupted for a couple of hours on the busy KRS Road. V.V. Puram Traffic Police, who rushed to the spot, diverted the traffic to the other side of the double road. Apart from the tree falling near ESI Hospital on KRS Road, trees were also uprooted on Vishwamanava Double Road in Saraswathipuram, Thyagaraja Road, near Surya Bakery in Hebbal, Srirampura 2nd Stage and other places. Mysuru City Corporation (MCC) Abhaya staff clearing the uprooted tree on Vishwamanava Double Road. The MCC Abhaya team, which sprung into swift action, cleared the trees and made way for the motorists. Luckily, no fatalities or loss of property were reported in these areas. Who is responsible for loss of life? In the wake of yesterday’s rain tragedy, the irate members of the public have sought to know whom to hold responsible for the loss of precious life. They alleged that though the roadside trees look strong, healthy and green, they fall due to small velocity of wind. Reason: The roots become weak and lose their grip as they are covered with tar without leaving space for the roots to breathe during asphalting of roads. Terming this type of asphalting as murder of trees, the public hope that the authorities concerned would take this into consideration and leave sufficient space for water and air to reach the roots when they take up asphalting works in future. This apart, the authorities should also identify weak branches and cut them (not the trees) before they fall due to wind, they opined. On Sunday, City recorded 7.1 mm rains, T. Narsipur-7.7 mm, K.R. Nagar- 4.9 mm, H.D. Kote- 3.6 mm, Periyapatna- 2.1 mm. Does the corporation authorities have some sense, why cant they identify and take appropriate action against dangerous trees before monsoon, every time they conduct swing action only after happening mishaps.